This covered van is a Great Western Railway 6 tons TEVAN number 79933. This was built in 1922 to Diagram X7 to lot 890 as a Mica B meat van. It was then in 1938 converted to this Tevan Special Traffics Van under Diagram V.31. 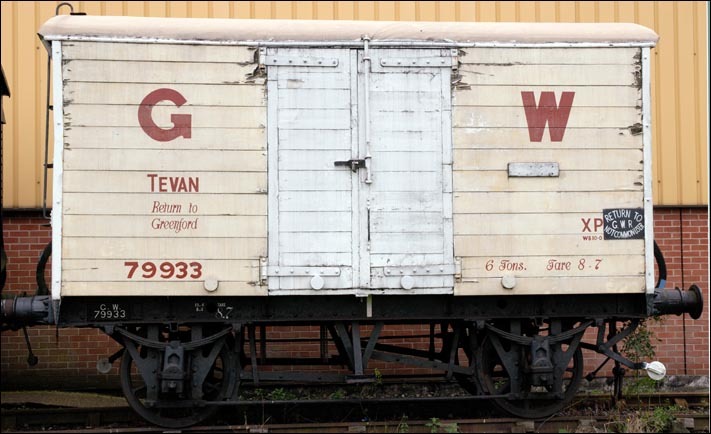 This Great western Tevan is one of around 50 railway wagons most of which were built by the great Western Railway or the British Railways Western Region that have been saved at the Didcot Railway Centre that is next to the Didcot mainline railway station.